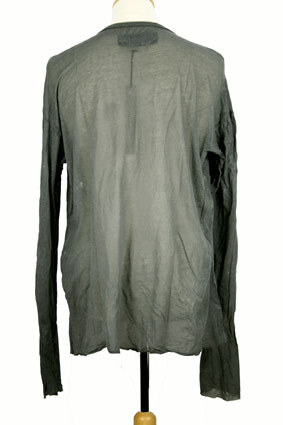 Rundholz Dip Collection over-dyed, distressed, fine stretch cotton jersey, long sleeved t-shirt in Grey Metallic colour. Round neck with ribbed trim finish. Off the shoulder arm seams. Raw edged on sleeves and hem. Over sized relaxed look. A beautiful garment in a great fabric.